Whilst we have heard a lot of rhetoric about Sri Lanka becoming the ‘Tiger’ nation of South Asia in the last couple of years, we are yet to see some ground activation on this direction. The fact of the matter is that unless there is a clear strategy nationally, the driver of the economy, the private sector, cannot have cutting-edge strategy. Japan is a classic example where with a clear national strategy, private sector brand Sony was able to become a household brand. Another example is South Korea. With a clear national strategy, a brand like Samsung cut through the clutter to become a world beater. Sadly Sri Lanka is yet struggling to emulate such practices. In 1946, the year after Japan’s defeat in World War II, the Government of Japan developed a strong private sector-based industrial strategy. In this background Sony was incorporated as Tokyo Telecommunication Engineering Corporation. The first products to hit the shelves were Sony-brand transistors, which became a hit all over the world. The company changed its name to ‘Sony’ in 1958, which is a combination of the Latin word ‘sonus,’ which means sound, and ‘sonny,’ a nickname for a small boy. This name evoked the image of vibrant youth and reflected the company’s ambition to grow. Sony became a household name in every single home with cutting-edge sound technology. Some even say that it was Sony that built the power of brand Japan. Samsung Electronics, on the other hand, was a subsidiary of Samsung Group established in January 1969 with an investment of 330 million won. Given the South Korean vision to conquer the world with the American influence, a clear Government strategy was developed focusing on the private sector. Initially Samsung Electronics was an obscure Asian company that was known mainly for exporting cheap and generic OEM products. But today, Samsung has grown from a small export business to one of the leading electronics companies in the industry, with the world’s leading products including No. 1 global market share positions for many categories. It is with this market dominance and ever-expanding array of award winning electronics products that Samsung has become brand to reckon with. Samsung, starting life with such humble beginnings with just 36 employees assembling electric fans in a small workshop south of Seoul, has today crushed giant Sony by a blistering sales performance of 176 billion dollars whilst Sony trails at just 68.4 billion. From a brand value indicator, Samsung clocks in a value of 45.2 billion and Sony is struggling to garner a 7.7 billion dollar value. In my view it is a crushing blow to a company like Sony that has been commanding global centre-stage for such a long time. But the key take is how the national strategy helped the two organisations fight it out globally. In other words, the shift in focus towards brands began when it was understood that they were something more than mere identifiers. Brands, according to Kapferer (1997), serve eight functions shown in Table 2.1: the first two are mechanical and concern the essence of the brand: “to function as a recognised symbol in order to facilitate choice and to gain time”; the next three are for reducing the perceived risk; and the final three concern the pleasure side of a brand. He adds that brands perform an economic function in the mind of the consumer, “the value of the brand comes from its ability to gain an exclusive, positive and prominent meaning in the minds of a large number of consumers”. Therefore branding and brand building should focus on developing brand value which is a new thinking that has come of age. Samsung has shown a continuous increase in sales from 2000 when sales was just 27 billion dollars; by 2015 it had crossed 176 billion. Sony, which was registering 68 billion dollars in 2000, today has declined to 63.4 billion which is a disastrous performance. Both these brands lost sales in 2008 due to the financial turmoil, but Samsung has recovered very fast and come to its highest-ever sales growth in 2015. However Sony’s recovery was not a strong one. As such, it lost sales again in 2010 and 2015. Samsung has shown continuous increase in profits while Sony is recording continuous loss. This is mainly due to the drop of sales of Sony and increased sales of Samsung. Sony had high overheads as it was operating as a premium supplier. Samsung had minimised its overhead to cope up with its challenges as it already had that capability in-house by being a value-for-money service provider for a long period of time. Due to these reasons Samsung has been able to increase its profit, which Sony could not do. Sony has cut its advertising budget to minimise the losses it has shown during the last decade. It is clear that Sony is trying to apply lean management practices to cope up with the situation rather than building the brand. However, Samsung on the other hand has spent a huge sum of money on advertising in order to build the brand. It has spent so much money in 2009 to build its brand after seeing a decline in sales in 2008. When we take a closer look at the brand value growth, one can see how Samsung has increased its brand value after 2009 to become a power brand in 2015 at 45.2 billion dollars. This is mainly due to its cutting-edge brand marketing work that has made it to the top-of-the-mind position in customers. Sony on the other hand has shown a decline in its brand value due to the phase off by consumers and today is valued at 7.7 billion as against the 16.4 billion performance in 2000. Samsung is a classic example of a company that is not only ruthlessly moving faster than competition to catch up but is also passing the leader of yesterday strongly. The best example is the latest refrigerator model by Samsung that has a built-in tablet computer that not only controls the temperature but also allows users to surf the internet, watch TV and send e-mail messages. One cell-phone model works like a fully-fledged digital camera and also plays music. The key to this success is that the company is hiring the best talent for the top positions in the company from around the world. This gives the company a typical international culture, making it almost a non-Korean company. One of the key reasons for Samsung’s earnings over the years is its holistic approach to develop several strategies for different regions, but guided by one unified Samsung brand image building strategy. It was a coordinated global program to make Samsung an international brand. 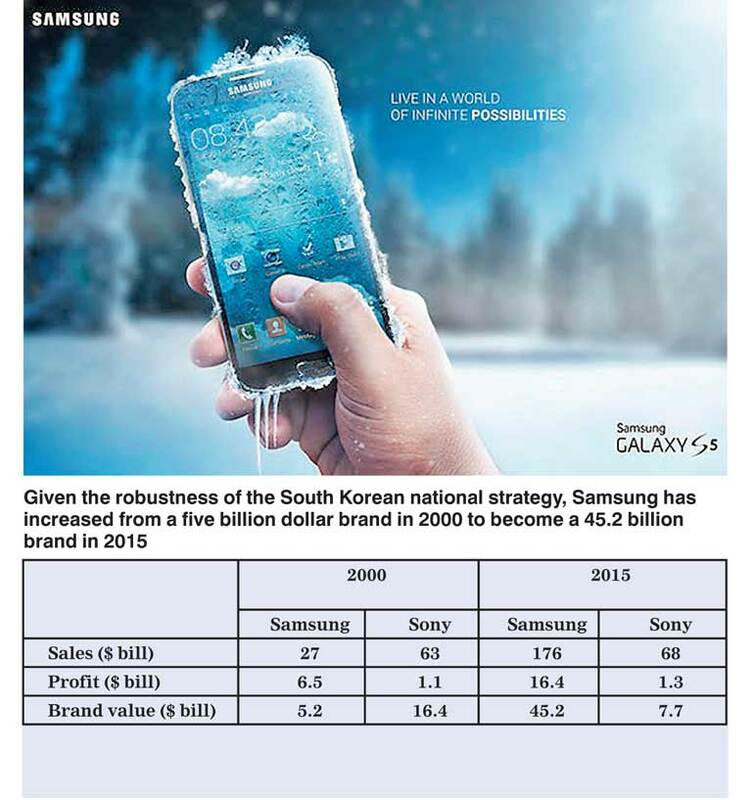 Over the last decade, Samsung has executed its comprehensive brand building strategy. The company’s annual investment in branding and marketing is about $ 3 billion, which has been spent to increase its brand awareness around the world. Today we can see the brand value of Samsung which has gone to the highest level that it has ever had. Samsung has come to the top 10 brands with higher sales and higher brand value with strong innovation, fashionability, quality and reliability a complete shift of its position 10 years back. On the other hand Sony has lost its brand value, sales and profit by trying to focus on lean practices. It has come to a position of less reliable, less innovative, and low quality brand, which Samsung was having in its inception. Sony must take stock and learn that change is the only way to survive in today’s dynamic world of business. But this involves new ways of working. It includes such disciplines like ethnographic research methodology rather than the traditional way of getting data from consumers. Now business requires raw insightful desires of consumers that can lead to products like the Apple iPhone, which is yet to be launched. A key implication for Sri Lanka is the need to have a clear national strategy so that brands can develop cutting-edge strategy. The world is moving very fast and one cannot sit on one’s laurels of past brand equity. You have to get close to a consumer and develop cutting-edge products and solutions. Consumers want solutions that will make their lives more convenient. Gone are the days when people were hung up on brand loyalty.